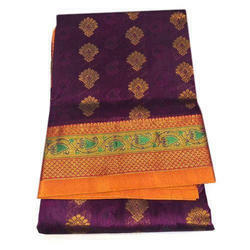 We have years of experience in providing our customers with Embroidered Silk Sarees. These are manufactured by our expert professionals, who have years of experience in this domain. Our entire range of sarees is adorned with heavy & intricate work, which adds to its aesthetic appeal. Matching up with the ever increasing requirements of the patrons, we are offering an eye-catching collection of Embroidered Silk Saree. In addition to this, our presented products are available in an assortment of sizes and colors. 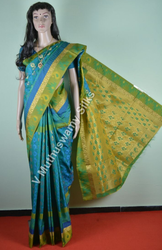 To meet the various requirements of the customers, we are involved in offering a wide assortment of Embroidered Silk Saree. Silk is synonymous with luxury with opulence. The saree in silk is everything you can imagine. Its sumptuous prints, vibrant color and luxurious fall seduces like no other garment can just right for beautiful female customers who deserve a taste of the luxurious.